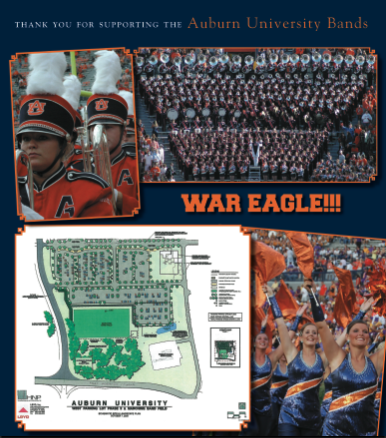 Support our Auburn University Bands by contributing to our New Band Building Fund! We have had the opportunity to share with you several exciting developments in our program over the last few years. The Auburn Band won the prestigious Sudler Trophy in 2004, we outfitted our members with new uniforms in 2007, and the Marching Band was invited to perform at multiple St. Patrick’s Day celebration events in Ireland in March 2008. Last summer, Auburn’s Band was one of only a few selected in the country to vie for recognition by Paramount Pictures in their competition for theme music for an upcoming movie. The support of Band friends and alumni makes these and other accolades and honors possible. But I think that this year’s news is some of the most exciting yet! The University is in the beginning stages of plans for a new Band Hall and adjoining practice field to be located off Samford Avenue on the west side of campus. Our current facility in Goodwin Hall served us well for a number of years. However, when it opened in 1974, the estimated number of band members was 200. Thirty-five years later we now have close to 400 students dedicated long hours of their time to make your Auburn game day experience outstanding. With twice as many uniforms to store and double the instruments to house, we needed a much larger and updated rehearsal area. Once complete, this newly launched project will provide a practice field located right next to a new Band Hall. Additionally, the new Band Hall will have an indoor practice area with modern acoustics to maximize our ability to train and educate our talented students. This will be a better storage solution for valuable instruments, equipment and props – some of which we have to leave in trailers next to the current practice field. More importantly, it will be a much safer environment for our students as they practice, rain or shine, throughout the year. A few years ago, we asked you to help us purchase new uniforms and last year you helped us travel to represent Auburn University in Ireland. Your gifts have always played a big role in our ability to have an adequate number of marching instruments for our members and helped with the basics we need to run our day-to-day practices, recruiting efforts and more. We need your continued involvement more than ever as we launch this project! An excellent way to show your support is to take advantage of the online donation form set up by the Auburn University Office of Development. It is very important that you select Auburn Bands as the University Department you designate to receive your gift. In return, we pledge to continue our legacy of outstanding performances for your enjoyment! Click here to visit the online giving page. 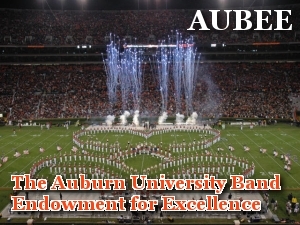 Support the Auburn University Bands Endowment for Excellence! You can make those priceless moments happen by contributing toward the Auburn University Band Endowment for Excellence (AUBEE). Now is your opportunity to support an institution that has been supporting Auburn University and Auburn Athletics for more than 100 years. We invite you to be a part of the Auburn University Band Endowment for Excellence, a campaign to support the Auburn Band program. Endowment contributions will be used only for band scholarships, which will help attract and retain top band students to Auburn University, and maintain the Auburn Band as one of the finest in the nation. Our goal for this scholarship endowment is $2 million, and various levels of membership have been established. From the days of the original Cadet Band at Alabama Polytechnic Institute, the Auburn Band has excited audiences with over a century of performances. A 100-year plus tradition of excellence has earned the Auburn Band a national reputation for superb marching and inspiring concert performances. The band has represented Auburn University at Gubernatorial and Presidential Inaugurations. The AU band program includes the Marching Band and three concert groups: the Symphonic Band, Concert Band and the Campus Band. In addition, two basketball pep bands entertain audiences at many athletic events throughout the year. Members of the Auburn Band are a diverse group of students who come from many states throughout the country and study in all academic areas within the university. This is your chance to support and be a part of something special! Please pledge your support by printing out our pledge form and mailing it in with your contribution today. For more information please call us at (334) 844-4166. Thank you and WAR EAGLE! Pledge your support by printing out the pledge form and mailing it in with your contribution. For more information please call (334) 844-4166. Thank you and WAR EAGLE!